We are a genuine working farm…we have angus cattle grazing in our fields, top notch wine production plus a wine-tasting room that is a renovated milking barn! Where we located? Well if you like historic towns we are just minutes north and south of Chestertown and Chesapeake City on Maryland’s Eastern Shore. We are very – very close to Middletown, Delaware so our rustic farm winery offers a great afternoon away from this thriving metropolis to sip local wines. Visit and you experience everything authentic about the eastern shore of Maryland, and glimpse into a new chapter of agricultural prosperity on the mid-Atlantic. We are open year-round and welcome your visit. Whether you are stopping by for an afternoon to sip wines in our tasting room, attending our farm-to-table events or enjoying a farmstay B&B with us you’ll experience genuine hospitality, friendly, knowledgeable staff, award-winning wines and rustic farmscapes to view. Please use our contact form below to send us any questions. We are just a 15 minute drive to Historic Chestertown …driving from the Bay Bridge north heading to Chestertown? Take in the culture of the town then Farmstay B&B with us and next day walk our trails and enjoy wine tastings at our wine tasting room. We welcome visitors and those who wish to take part and lend a hand in our vineyard and winery operations. Consider being a part of our Crow Harvest Team. Contact us with your interest. We have several trails on our farm. The Vineyard Trail parallels our vines and starts behind the Haybarn. The Cottage Trail leads you to the cottage the miniature horse pasture, past fields of grain and along our back woods. You’ll likely see our herd of Grass-fed Angus along the way! 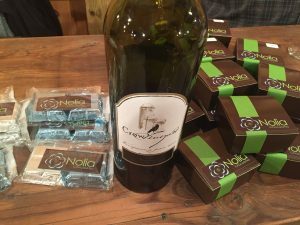 Our wine tasting room not only presents our Crow Wines and Grass-fed Angus Beef for sale but as well Crow apparel such as t-shirts and often specialty items from local artisans. Check out our Crow Savor Shop. We are open every day noon to 5 pm all year round except major holidays. During the warmer months sit on our tasting room patio. Please use the form below to contact us with any question you may have! We look forward to hearing from you! Welcome to Crow Vineyard and Winery....located just north of historic Chestertown and south of Chesapeake City on the Eastern Shore of Maryland. We'd like to share a little history on the two companies that the Crow’s have here: Crow Farm and Crow Vineyard and Winery. Crow Farm is a third-generation farm passed down in Roy Crow’s family which is how the name for the farm and vineyard came to be. Here in the tasting room this used to be an old milking parlor now all renovated and the tasting room just had it’s five-year anniversary this past summer. The farm is a 365-acre working farm, with currently 12.5 acres of vines, a winery where all the wines offered are made, a farmstay bed and breakfast as well and 100 head of Grass-Fed Black Angus Cattle. On our tasting menu you can find all the wines offered divided into different flights you can choose from. In 2010 the Crows planted their first vines and those are the Vidal grape and the Barbera grape. You will see red stars - these are Estate grapes grown in the vineyard plus all of the other grapes are grown locally from vineyards the Crows have partnered with. A little bit on the style of wine, the Crows have a wonderful style of wine that is on the dryer side .... many of them have won awards! And if you like very sweet be sure to finish with the Desert Vidal Blanc. While you look over the menu to choose a flight, please write your notes on the notepad we provide. Also ask us about the different beef cuts Crow farm offers. We offer farm to table events, so sign up for our events newsletter so we can let you know what is going on. If you are interested in adding food with your tasting, Crow Vineyard offers Farm to Table specialties. Currently we feature a local cheese and winter sausage platter and on weekends the Crows offer Farm to Table soup or sandwiches. During Wine Down Fridays this January and February when we offer extended tasting room hours til 7 pm enjoy farm to table Crow Chili made from our Grass-fed Angus Beef! 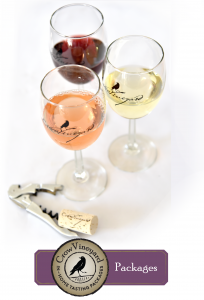 Enjoy your visit your tasting and consider buying local and shop our online Savor Shop.